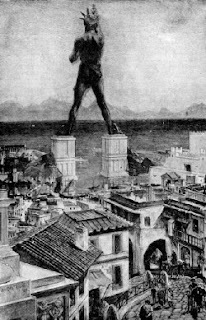 The Colossus of Rhodes was a statue of the Greek Titan Helios, erected in the city of Rhodes on the Greek island of Rhodes by Chares of Lindos between 292 and 280 BC. It is considered one of the Seven Wonders of the Ancient World. It was constructed to celebrate Rhodes' victory over the ruler of Cyprus, Antigonus I Monophthalmus, who unsuccessfully besieged Rhodes in 305 BC. Before its destruction, the Colossus of Rhodes stood over 30 meters (107ft) high, making it one of the tallest statues of the ancient world. Ancient accounts, which differ to some degree, describe the structure as being built with iron tie bars to which brass plates were fixed to form the skin. The interior of the structure, which stood on a 15-meter- (50-foot-) high white marble pedestal near the Mandraki harbor entrance, was then filled with stone blocks as construction progressed. Other sources place the Colossus on a breakwater in the harbor. The statue itself was over 30 meters (107 ft) tall. Much of the iron and bronze was reforged from the various weapons Demetrius's army left behind, and the abandoned second siege tower was used for scaffolding around the lower levels during construction. Upper portions were built with the use of a large earthen ramp. During the building, workers would pile mounds of dirt on the sides of the colossus. Upon completion all of the dirt was removed and the colossus was left to stand alone. After twelve years, in 280 BC, the statue was completed. Preserved in Greek anthologies of poetry is what is believed to be the genuine dedication text for the Colossus. To you, o Sun, the people of Dorian Rhodes set up this bronze statue reaching to Olympus, when they had pacified the waves of war and crowned their city with the spoils taken from the enemy. Not only over the seas but also on land did they kindle the lovely torch of freedom and independence. For to the descendants of Herakles belongs dominion over sea and land. The statue stood for 56 years until Rhodes was hit by the 226 BC Rhodes earthquake, when significant damage was also done to large portions of the city, including the harbor and commercial buildings, which were destroyed. The statue snapped at the knees and fell over on to the land. Ptolemy III offered to pay for the reconstruction of the statue, but the oracle of Delphi made the Rhodians afraid that they had offended Helios, and they declined to rebuild it. The remains lay on the ground as described by Strabo (xiv.2.5) for over 800 years, and even broken, they were so impressive that many traveled to see them. Pliny the Elder remarked that few people could wrap their arms around the fallen thumb and that each of its fingers was larger than most statues. Did WWII end in 1972? Where in the World is Voltaire?